German engineering in da House! Just as it sounds! Here you will find information and many pictures of the more different Volkswagen models that are known and unknown. Hope you get a lot of interesting reading and you will find a favorite among this collection of odd and rare models. 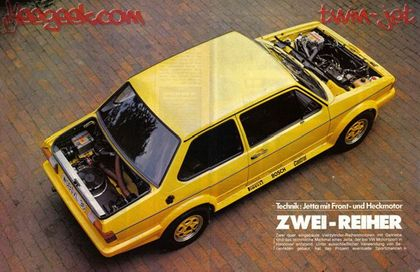 2 x 1,6L four cylinder engines with total 220Bhp (160Kw) at 6100 Rpm. Max torque 315Nm at 5000 Rpm. Each engine has separate electrics and power components. Two 5-speed sport geraboxes (originally from stock GTi´s) with manual brake proportiononing. Hydralic handbrake. 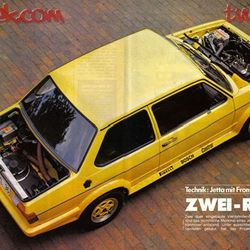 2L 16V four-cylinder engine with 275 HP (202 kW) at 6000rpm, 375nm at 3500rpm, katalysator, 6 speed gearbox, Bosch Digifant injection-system, with an KKK-turbo, bore 86,0 , stroke 86,0 The development of the A59 began early in 1992 until the project took an end in 1994. One of the causes where the cost of the project and what it would be to expensive. The A59 never enter production. 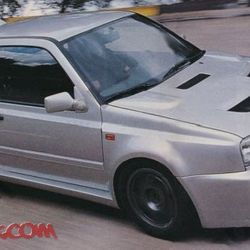 the Story about the Swedish Golf R32 from 2003, which was totally rebuilt for drifting. The guys who built this car was not content merely to replace the original powerful V6 engine for a Chevy LS1 V8. They increased stroke, and put in bigger pistons in the engine so they got a 6.2 liter engine! But the Swedish guys who built this car did not stop there .. they changed the gearbox, converted the car to rear wheel drive, etc. .. The job is done by Daniel Björk and Peter Steinwandt, Sweden. In July 1987 took driver Jochi Kleint an attempt to take the fastest time in Pikes Peak international hill climb ”The race to the clouds”. 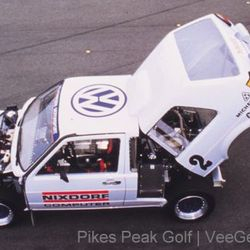 The car that Volkswagen Motorsport had built for this race, was an twin-engine 1.8L 16V engine. Both engines was supercharged with an turbo (the first car without suffered greatly at altitude in the peak). The whole car was built of aluminum and steel, with the the front and rear completely removable. If you want to be the first to know when a new model adds up, be sure to joinVeegeek.com on Facebook!